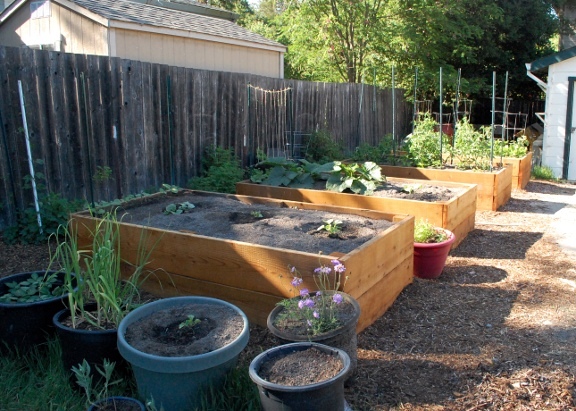 In My 2013 Garden Plan, I mentioned we are putting in raised beds this year. Well, they’re in. I wanted a permanent structure, so what you’re looking at are 2-foot-deep redwood beds with two layers of gopher wire on the bottom. While Mr. 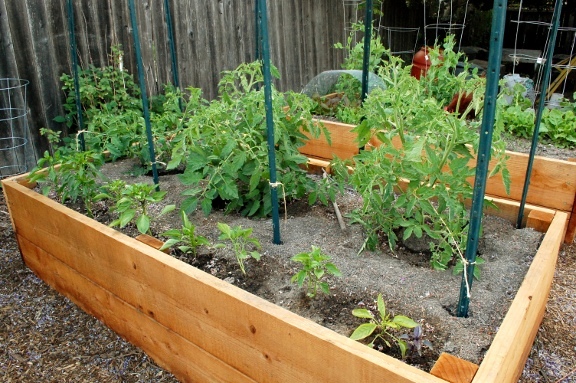 Savvy could have built me such a thing, the local hardware store was selling finished raised beds for about the price of the redwood lumber, so we bought and assembled them instead. They are working out great so far. So far, the plants are the healthiest I’ve ever put in. Let’s geek out about my garden, shall we? In this bed, I have plants all grown from seed. It’s a little hard to see, but I have a row of leeks (the grass-looking things in the front) and heads of lettuce under the wire mesh. The mesh is there to give the lettuce relief from the sun. Behind that, which you can’t see, are some spinach. To the right front of the lettuce, I have what’s left of a row of radishes. I already harvested most of that crop and have replanted with dragon tongue bush beans, which I’ve never grown before. Between the radishes I have baby carrots and yellow beets. In the three tomato cages behind the lettuce, I have three variety of snap peas. In the far right cages, I have two lemon cucumbers. I have a third cucumber growing in the ground in a gopher cage, too. I couldn’t resist because I love cucumbers. There’s also a basil plant in there too. 1. It seems to work to plant a bunch of lettuce close together and then thin every couple of days, pulling out the baby lettuce plants as you go along. 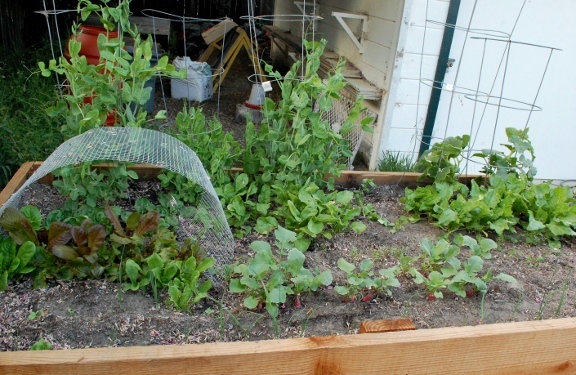 If you are diligent about this, you get a steady supply of lettuce as they grow bigger. Now that the lettuce are starting to form heads and suddenly need a lot more room, it’s a little hard to choose what to pull out and what to leave in, but my salads have been fabulous so far this year. I’ve been picking them off. There’s so many good bugs in the garden this year, I’m reluctant to spray. 3. Baby beet greens taste great raw and are excellent in salad. This much simpler bed has three things in it: tomatoes, bell peppers, and one purple basil plant. The tomatoes are the main reason the beds are so deep. Many nurseries will tell you a tomato will thrive in a 10- or 15-gallon pot, but when you look at how I plant tomato plants, you’ll see why my tomatoes need a lot of space for roots. These tomato plants are doing great so far. They are a brandywine tomato, a beefsteak, and an early girl. The peppers are two spicy pappers, a jalapeno and a thai-like spicy pepper. The rest are chocolate, yellow, and red bell peppers. This year I’m going to make jam with my excess peppers. I’m trying one more thing with the peppers: I read that if you snip off the flowers early on, it makes the plants bigger and then they produce more peppers because they’re stronger plants. I tried it with the two at the far left and indeed, they did seem to redirect their energies and get bigger than the other plants. We’ll see if they produce more peppers that way. I wouldn’t mind creating a post or elaborating on some of the subjects you write in relation to here. Again, awesome website!